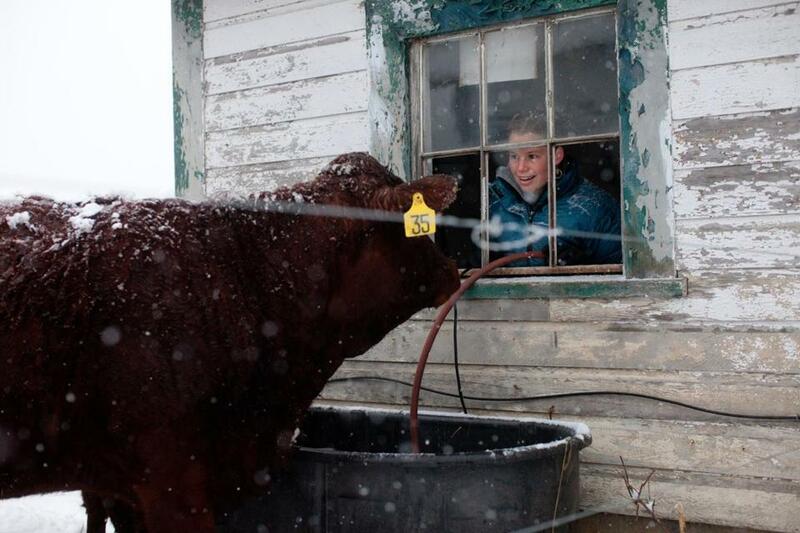 Student farmer Caitlin Sargent of San Anselmo, Calif., looked out at one of The Farm School&apos;s Red Devon cows during chore time on Jan. 16, 2013. ORANGE — It’s cold here. Sub-zero cold. The sun just rose somewhere behind the curtain of snow, but there’s nothing piercing or warm about its rays. Our herd of Red Devons appears to float, orbiting a bale of last September’s grass. I stand, transfixed by the whiteness of it all, but a blast of wind hurries me along toward the warm farmhouse and a pile of scrambled eggs. Deep winter is finally upon us here at The Farm School. Outside, life has retreated deep within the soil to await the springtime thaw. Inside, we cozy up with tea and seed catalogs to dream big about the coming spring. But that idyllic scene is tempered by reality. 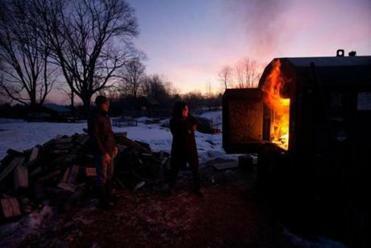 We’ve spent hours pleading with our fussy wood-fired boiler, which seems to produce more smoke than heat. And recently, we’ve ended day after day with lukewarm showers, which in a 50-degree farmhouse makes the depth of winter feel rather inescapable. Add to this my genius idea of hauling a welding machine across the shop by myself, in the process spraining my back and transforming myself into a 90-year-old man. Now I’m left without my most important tool — my body — and instead, I’m humbled every time I try to put on socks. With my back in knots, I’m left to meekly place twigs one at a time on a slash pile and watch as my fellow apprentices reduce trees to cordwood. They’re good-natured enough and alternate between kindly offering to tie my shoes and calling me “Old Man Jacobs” (an image I did nothing to deflect by bringing my own rocking chair to crop planning class). But the truth is, I’m feeling every one of my 35 years, and my confidence is shaken. Dina, and I hope to do this solo with no sick days, plus an infant to care for. Maybe our kid won’t mind helping with chores one day. I know Dina is already looking forward to it. But we haven’t seen each other in two weeks and that future — of us, our farm, and a baby to boot — feels about as distant and theoretical as the green growth of spring. But as bone-chilling and nerve-rending as this polar plunge can be, it’s critical to the growing season ahead, I’m learning. Each deep freeze knocks back pest populations over-wintering in the soil. The harsher the winter, the fewer Colorado potato beetles will be lurking in our hedgerows waiting for the earth to warm. The shorter days and time inside have also forced a degree of introspection that won’t be possible once the exhaustion of planting season begins in March. In that time, we’ve been thinking a lot about the dollars and non-cents of farming, drafting a business plan, and visiting area farms to see how they stay afloat. And I think I’m finally ready to admit that there’s no way to spreadsheet our way around the financial struggle we will face as farmers. But I’m also realizing that farming is about embracing a more holistic view of success than what the financial bottom line may show. It is easy to overlook the value in working land without despoiling it and transforming food into community. And for me, there is something meditative about this new life — the stillness of a snowstorm, the cadence of chopping wood, and the awesome mystery of seeds. It connects me to something deep, something that transcends economics. Even with a body temporarily broken, unpromising numbers, and a blinding ocean of white, other things, I sense, are adding up just fine.